Greetings from Freiburg Germany. 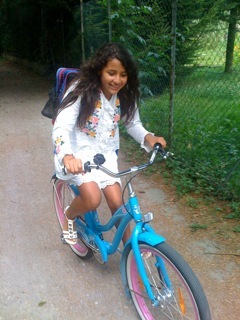 My family loves your site and I was wondering if you could post a photo of my daughter on her cool cruiser. She would get a kick out of it. Keep up the good work. Our pleasure, Lee! Duly blogged! Thanks for sending us the shots. How very cool and she looks so chic and happy! Freiburg is a very beautiful city with a lot of people using bicycles. 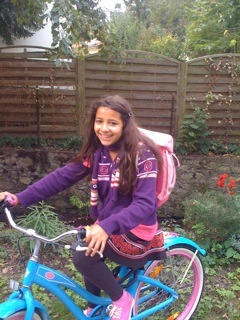 I went there from Besançon (where I live, in France, about 200km far from Freiburg) with my bicycle and it was great !